There are many great ways to beautify your yard, but one of the most relaxing features you can add is a koi pond. Having a water feature in itself is great, but the addition some fish increases the attractiveness and tranquility of your outdoor space. While it might seem like a huge project with a lot of difficult maintenance, it’s not as tough as you might think. Let’s have a look at what’s involved in setting up and maintaining this amazing part of your yard. Working in stamped concrete, we come across many homes and businesses that already have their ponds installed or are working toward getting them. We’re not experts on the ponds themselves, but one of the things we do know: buying the fish is one of the last steps you want to take. Obvious, isn’t it? But sometimes we all get that urge to rush ahead and enjoy the end result without going through all the work. However, it is a good idea to start talking to your local pet store about your plans. They’re going to be the ones to advise you about what works best in your area. You’ll have to be concerned about aspects like water evaporation, the depth of the pond, and even animals in your area that might find your new pets appetizing. They’ll also help you understand what size fish to start with, how long they’ll live and how big you can expect them to grow. Remember, these are living creatures and you’ll need to be prepared for all their needs! There are many benefits you can enjoy when you add a koi pond, too. We’ve already mentioned one of the best – it’s beautiful! A pond is already attractive, but adding fish makes it even moreso. Another plus is the sense of peace that these elements bring. There’s something that relaxes us while watching these creatures glide silently under the water, and it’s endearing when we see them breaking the surface looking for the food that you’re about to provide. Teaching responsibility to children is another potential benefit. As with any pet, a child can help in the care of your koi and the pond in general. They can assist with feeding, caring for pond plants, and even water changes. Of course, always properly supervise children because even a small pond can be dangerous if they fall in. 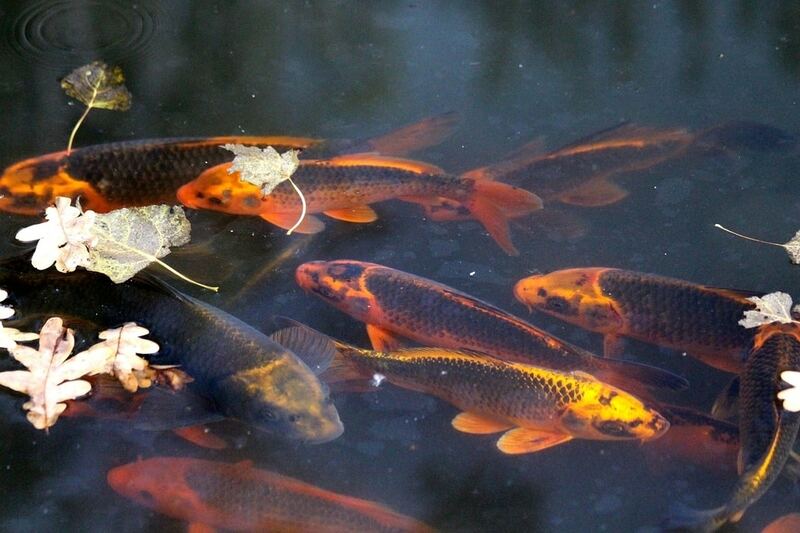 Pest control is another potential benefit of having koi, especially if you want to have a pond anyway. The koi will eat insects on the water’s surface. While mosquitoes will be attracted to the pond to lay their eggs, the koi will eat the larva, keeping these annoyances under control. One last benefit we’ll mention for now is that adding a koi pond or planted pond can attract other wonderful creatures as well. Small animals and even deer may come to enjoy a sip. Frogs and other amphibians may make it a home as well. You’ll be amazed at the great variety of creatures you can have around! Will A Pond Work In Your Climate? 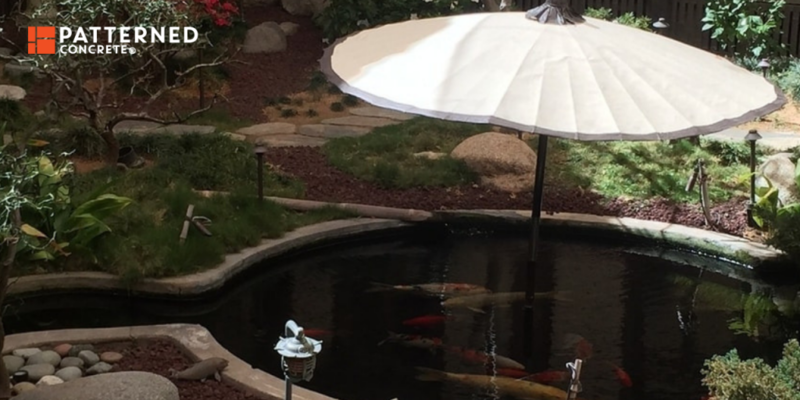 We were amazed – and guess you might be too – that even in a really cold climate where your pond might freeze over, you can still have a great koi pond. They can survive just fine – living under the ice! The most important factor to consider here – and this is one reason you should talk to your pet store or another specialist first – is how deep your pond should be. Remember, water in a pond or lake generally freezes on the surface, but the water below that is actually warmer. Having a pump that adds oxygen into the water can be helpful all year, but especially in winter. If the pond has a large surface area or a feature like a waterfall, it may capture enough oxygen that way to the point the pump isn’t necessary. But it’s always better to have the pump, and when the pond is frozen over, it’s almost essential. Also remember that fish are cold-blooded creatures, not like us. This allows their bodies to regulate better and adjust even in colder temperatures. Of course, as we said, the water below the ice actually maintains a much warmer temperature than the air you feel above it! Where Can I Put My Pond? Choosing the right spot for your pond is an important spot. There are a lot of practical considerations to take into account. First, make sure it’s not going to be a huge inconvenience for moving around your space. While you don’t want it hidden out of the way, you also don’t want to obstruct the necessary paths through your yard. Don’t have it so close to a walkway that you might accidentally fall in. Nor is it a good idea to put it in the path where you have to pull your lawnmower out of the shed! Think carefully about a good location where it won’t be an annoyance but where you can still easily enjoy it. Also, don’t forget to check with your utility companies about any buried lines that may cross the area. Driving a shovel into through a pipe or electric line can at best cause inconvenience and at worst be deadly. Many cities have a number you can call to check where lines run, rather than having to call each utility individually. On the other hand, you’ll need a filter and maybe other electrical accessories for your pond, like lights. So you want to be sure you can have access to an electric outlet. Also, for the sake of the pond and its residents, there are elements to take into consideration. First is calculating the space needed. That’s going to include the size of the pool – but not just its surface area. You also have to take account of accessories like filters. Of course, you’ll have to consider any plants you want around the pond, too. A spot that gets some sunlight, but not long periods of direct sun, is ideal. Too much sun could overheat the water, which limits how much oxygen it can hold. It can also create uncontrollable algae growth. One final point: you probably also don’t want it to be directly under a tree – otherwise, you’ll spend far too much time pulling leaves out rather than enjoying your pond. Getting your pond installed does require some hard work – unless you choose to have it done for you. Many garden centers and landscapers will offer the service. But if you’re more of a DIY type, here’s a brief overview of what’s involved. First, you have to choose between a pre-made pond and one that’s more “customized” and uses pond liners. We’re just going to talk about installing the pre-made type here, since using pond liners is a good bit tougher. You’ll often see the pre-made pond “shells”, which basically look like plastic bathtubs in various shapes and sizes, at your local garden shop. Here’s a quick overview of the steps involved in installation. Dig a hole. Here’s where the hard work comes in. You have to dig a hole for your pond to fit in. If it’s a pre-made pond just measure it as best you can and dig your hole based on the measurements. Put the pre-made pond the hole. Fill dirt in around it. If the pond isn’t pre-painted with a protective coat, be sure to spray it with one. Wait about 90 minutes to allow the paint to dry. Add water. Fill your pond about 75% – 80% full. Remember, you’re going to be adding other things to the pond, so you don’t want to fill it completely with just water. Add gravel. 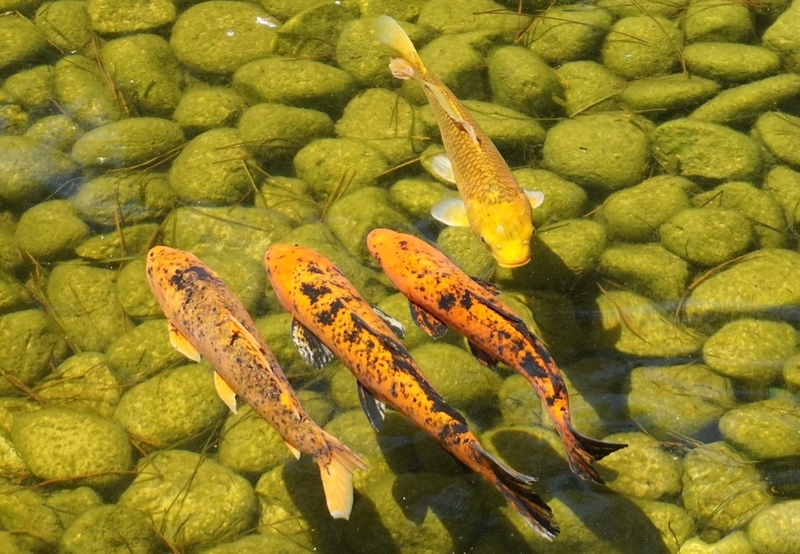 Fishpond gravel adds to the beauty of your pond, but it also gives a place for beneficial bacteria to grow. This bacteria helps clean up some of the harmful chemicals in fish waste. To help that bacteria grow, pet stores also sell bottled bacteria to help spur its growth in your pool. Add that now according to its directions and allow it about an hour to spread throughout your pool. While you’re waiting, you can start adding “trim” elements. For instance, you might choose pieces of flagstone for around the rim of the pond. Or you can add plants that go along the edges. Add your water-based plants. Be sure to research what plants to use, because koi will eat certain kinds. You also want plants that will survive your climate. Remember too that your plants will grow – you don’t need to have a “finished” look yet; instead, allow space for them to spread. Set up your pond filter next, according to its instructions. Be sure to keep the intake and outtake hoses as far separated as possible. This helps keep the water moving instead of just filtering the same water constantly. The filter helps keep the water clean both to look at and for the fish to live in. This should be a pond filter designed for the purpose; most swimming pool filters would get clogged quickly with fish waste. Add any other components now. For instance, an ozone system helps add oxygen and may be the best form of pumping oxygen in. Also, if you want underwater lights or other features, it’s best to add them now. It’s possible to add them later on, but that can cause stress to your fish. It’s best to do as much as possible before bringing the fish to their new home. Now that all this is done and everything’s up and running, it’s time to let the pond cycle. This is a process and period of time that doesn’t take much effort on your part, but it does allow those beneficial bacteria to start to develop. Read up on the nitrogen cycle for fish and what cycling means. The process can take about a month or so. Once your new pond is cycled, it’s time to buy your fish and add them! 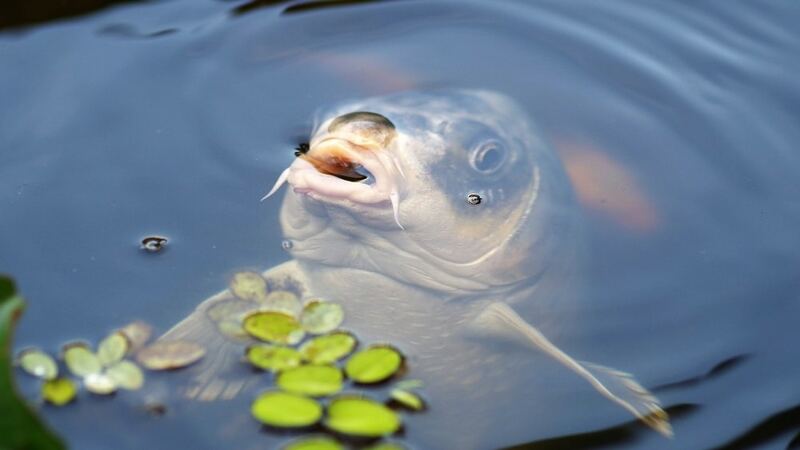 Be sure to stick to the fish that your pond is designed for. Koi (and some goldfish) do well in this environment, but you can’t add tropical fish; they’re not designed for this kind of environment. Also, remember that koi can get huge, measuring 2 – 3 feet (nearly a meter). Again, consult with your pet store experts about how many fish your pond can hold, and how much and how quickly they will grow. They’re not going to stay small forever, so don’t overstock. While you’re at it, it’s a good time to buy fish food too! Various sizes are available, and your koi will go through it quickly. Once you’ve purchased your fish and bring them home, it’s usually a good idea to gradually get them acclimated to their new environment. For instance, float their bags inside the pond for 20 minutes so the temperature balances. Then add water from the pond to the bag (about a 50-50 mix is good to start) for another 20 minutes. Then it’s fine to release them into the pond! This slow process helps reduce their stress going from one type of water condition to another too suddenly. Now that you’ve got your fish in their new home, don’t forget to take good care of them. We’ve already talked about being prepared for seasonal changes based on your climate. You’ll have to do more research for your area to see what’s necessary. And you’ll also have to pay attention to how your fish are reacting to changes in temperature and other weather conditions. You’ll also have to make sure to keep your pond clean. That means making sure dead plants and anything that may have fallen into the pond are removed. It might also mean you have to trim back or remove some of your live plants if they start to take over the pond! Regular water changes are also important. These help to remove pollutants from the water that get to be too much for the helpful bacteria and the filter to handle. Water changes almost never means changing all the water in your pond. Usually, it means removing and replacing about 20% of the water. Finally, learn to recognize signs of stress and illness in your fish. For instance, if they’re breathing air too much, there’s probably a problem with oxygen. They also can exhibit different behaviors that show they might have parasites or other issues. By being aware of these issues, you can help restore your fish to full health and keep their problems from spreading. There is maintenance involved, definitely. But overall it’s not extremely difficult nor does it require huge amounts of time. And it’s a great way to spend more time in your yard surrounded by nature! We want you to be able to enjoy your home to the fullest extent. Even though our specialty is stamped concrete, we know that a koi pond can be a great addition to your home. And we’d be glad to add decorative concrete features around it to enhance its beauty. Having a koi pond is a great way to increase your satisfaction and relaxation. We can’t wait to see yours!